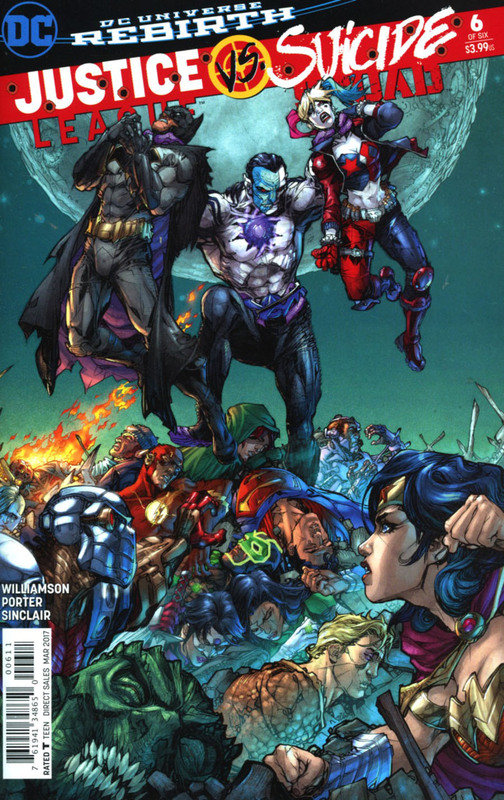 We start with the Squad battling the Eclipso infected League at the White House in Washington. The Squad don't fare so well, and they start to lost members to Eclipso himself, as he starts to turn them on by one. Batman remembers that sunlight is Eclipso's weakness, and asks Killer Frost to make a prism using her powers, one that will stand up to Superman's heat vision. This would mean that Killer Frost would need to use all the power in her body, which could leave her dead. She does so, and Batman manages to trick Superman to aiming his heat vision at his direction. Once the beams hit he prism, the light scatters to everyone close by, releasing them from Eclipso's control. Max lord falls to the ground, free from Eclipso, and Amanda Waller orders Killer Frost to take all of Max Lord's life force to sustain her. Killer Frost refuses, and falls to the ground dying from the lack of heat she needs to sustain her life. The League and the Squad gather together and feed little bits of their own energy, to help Killer Frost to recover enough so she doesn't die. Later at Belle Reve, Superman tells Killer Frost how truly brave she is, and that it wasn't suicide on her part, but rather a sacrifice for the greater good. Lobo tells Batman he owes him one, and that he is a man of his word. Batman tells Lobo he wants him to join a Justice League of his own. We end with Amanda Waller visiting Max Lord in his holding cell at Belle Reve, where he strapped to machines that pump blood thinners into his body, meaning if he were to attempt to use his powers, he would bleed to death. Max reveals that he figured out that it was Waller herself that masterminded the whole fiasco, just to protect herself and make the Squad an invaluable commodity. He then asks if he will be recruited to her Task Force X now too, to which she says no, but he will make a great addition to Task Force XI. Story - 4: Let me start by saying this was a strong ending to a good crossover. I know that a lot of people had mixed feelings about this. Some liked it, while others didn't. I can't speak for anyone else, but I did enjoy it. I thought it was entertaining and it served to forward the on-going narrative for both the Justice League and the Suicide Squad. Last issue I stated that I wanted there to be some on-going repercussions. I wanted the League to be remembered by the people, that they took over the world in a matter of minutes. I wrote that I wanted there to be consequence for the characters. Apparently some thought that I wanted them to return to the New 52 "everyone distrusts the heroes" setting. This was not the case. When I said consequence, I meant that I wanted to read more stories of the JL going out of their way to win back the trust, and ensure everyone that they will do their damnedest to ensure that they never fall into another situation such as this. I wanted the repercussions to be a reference to this story for some time to come, and become a reference point, much like Death of Superman, The Crisis and most of all Flashpoint. It is then that this crossover becomes an event, instead of a just cashing in on the Justice League and Suicide Squad films. However it would appear that this crossover will indeed lead into other events and storylines in the DCU. That much was certain during the reveal at the end. With this final issue of this crossover, I don't think it would be a huge surprise to anyone that Batman would be the one to save the day, as he is always the man with the plan. I am a Batman fan, and I won't hide it, however, it is getting really tiring that only he can save everyone at any given situation. I know that he is DC's cash cow, but it could have easily been any other character... Wonder Woman for instance. She even has an upcoming film in a matter of months. I also thought it was a little too much, that Batman is the one who recruits Lobo into the upcoming JLA team. In all honesty, Lobo should have at least tried to smack him half across the world for blowing up his head... Even if he was under Max Lord's influence. Batman's speech to Waller was one we have seen many times over as well. It would have been more impactful if he had Superman to back him up, or any member of the League for that matter. As the case with Batman, we knew that Killer Frost would be elevated to the next level from the Squads side. Williamson peppered the clues throughout the entire series quite heavily. That's the unfortunate side of seeing promo's in weekly books... They give away stuff like that. Almost the entire crossover was predictable, but I did like that Williamson captured Superman's voice and spirit rather well. Of course I don't like that he gets knocked down more often than he should, for the sole purpose of making smaller second and third tier characters seem more of a threat, I like that he is still the guy that will go and check on a player from the other team, to see if they are alright. Case in point, at Belle Reve after everything is all done and dusted, Superman is the one that tells Killer Frost, what she did wasn't Suicide but Sacrifice. And she almost killed him. This to me is what Superman is all about. One of the most enjoyable aspects for me was Amanda Waller's characterization. Williamson managed to turn an already diabolical character into a truly devilish and borderline evil entity. Why an entity, because like Batman, she may be human, but one that has transcended her mortal status to something a lot more distinctive and more valuable. The reveal that Waller was the one that planned the whole thing almost meticulously, puts her in a fine league of characters in the DCU. However, it was the last part of this reveal that really killed my buzz. She did all this, to make the Suicide Squad seem indispensable, because Batman was starting to come after the Squad... Really... All this to protect yourself from Batman?... And people have complain that Superman is too over powered! As many of you know, I don't like to be too negative in my reviews, however, Batman shouldn't be this much of a threat, that she needs to almost destroy the world just to keep her Squad safe. It would have made more sense if the entire League and the Government were to sniff around, as well as her needing to take out Max Lord, because he was too big of a threat to be left loose. This is the reason why I graded it a 4 instead of a 5. That and also I kept hoping that at some point both Cyborg and Aquaman would have more to do. Williamson seems to have also borrowed another trope from Marvel, with the Task Force XI or Task Force 11. Back in the mid 2000s it was revealed that the Weapon X project that gave Wolverine his Adamantium skeleton actually stood for Weapon 10, as Wolverine was the 10th attempt at creating a living weapon, with Captain America being Weapon 1. It would now appear that Task Force X is the 10th iteration of the Suicide Squad. Meaning there are nine other Squads that came before. We have seen the first Squad, so there are eight more that we have yet to discover. Lastly I have an admission of guilt. In my review of the first issue, I wrote that Superman is Pre-Flashpoint, Therefore he should know who and how bad a threat Max Lord is. Then I remembered that his and the rest of the world's knowledge of Max Lord was wiped from everyone's memory, when Max returned back to life during "Brightest Day". Max mind wiped the entire world, save just a few members of the Justice League he was in charge of at one point in history consisting of Booster Gold, Capt. Atom, Fire, Ice and Guy Gardner. So that's possibly why Superman doesn't remember him. All in all, it was a good little crossover. It wasn't universe shattering, there weren't 52 different tie in books and it wasn't compulsory to read, if you are just a casual reader/fan. Art - 5: Let me start by saying, welcome back to the Justice League Mr Porter. 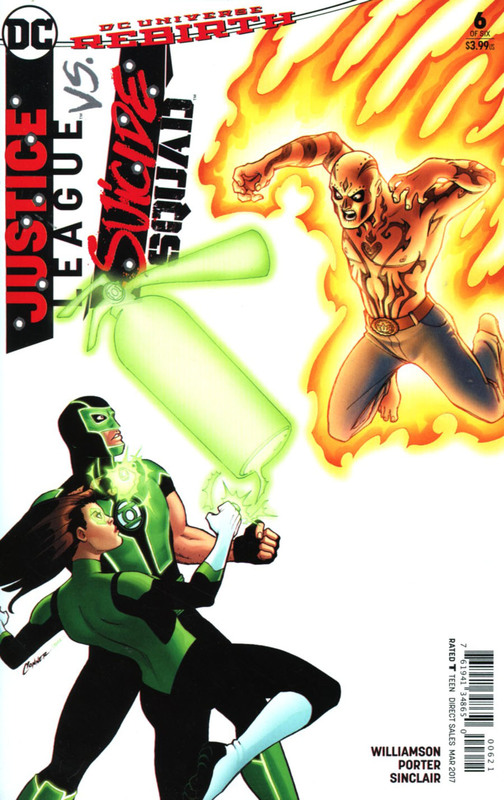 For any of you that may not know, Howard Porter was the penciller to the JLA series from the late 90s to the early 2000s written by Grant Morrison. Porter's art was a fresh look for DC at the time, and he was quite the fan favorite. Later he seemed to just disappear of the radar for many years, after completing only half his run on the Trials of Shazam series. I thought that he may have just retired from drawing comics and moved onto some other profession. I later found out that he suffered a serious injury to his hand, almost severing some tendons. As of the last few years he has returned back to DC. Seeing his work on Superman Beyond, it was evident that his art had changed due to his injury, so I was very pleasantly surprised to see what an amazing job he had done with this issue. I really liked the art, it a surprise to the previous work I had seen from Porter. Handling the entirety of the art chores save the coloring, Porter bought a really kinetic energy to the art. I love the softness of the line work, with the darker shades only appearing in the starkest parts of the images. It's as if only half the art was inked, while the smaller and minor details were left in pencil. Porter is a great visual storyteller, I've always liked the fact he relies more on panel work to forward the story, and less on splash pages. His panels offer an almost play by play account, which made the action scenes more impactful, just look at pages 6 and 7. It's as if they are storyboards. Character wise, Porter seems to get the look of each character down nicely. No one character, looks like the other. They all have individual body shapes and sizes. The only other artists I feel are really good at his are Carlos Pacheco and Doug Mahnke. I love the classic look to Lobo, and his Superman looked really strong... It's a shame that the colors couldn't liven up his suit, which is not a dig at Sinclair's awesome coloring, it's just the suit has too much blue! Thank goodness that is about to change in the near future. The only two characters I didn't care for too much were Batman and Killer Frost. I have never really liked the way Porter drew Batman, especially in the JLA series, though here, his Batman is a huge improvement. I just didn't like way he drew Killer Frosts face. She seemed a little too sickly, then again that may have been what Porter was going for. Lastly, I can't leave without saying what an awesome job Alex Sinclair managed to do throughout the series. He tied the tone together really well. Colorists really are the unsung heroes of comics at times. Cover Art - 5: The composition is great, really nicely fits all the characters on the cover. However, I hate that its Batman and Harley Quinn that are the two characters that Eclipso is holding up, as the last to be defeated. Realistically they'd be the first to be taken down...Then again they are the two most popular characters DC has right now. Variant Cover Art - 2: This cover does nothing for me. I haven't really enjoyed these covers at all really. Variant Cover Art - 4: The legendary Jose Luis Garcia Lopez (praise be his name) rendered this cover. It's not fantastically striking, but it is leaps ahead of the other cover.